The app helps to batch-upload photos to your Facebook photo albums and share with your chosen friends. If you share an album using a Facebook friend list (can be an empty friend list initially), you can easily control who can have access to an album by adding or removing friends from the list. - Facebook-issued access-token (not the username and password) is stored locally on your device, which is accessed to authenticate your identity to Facebook only when you use the app to access Facebook photos. - Since the access-token is stored locally on your device, there is in no way that your Facebook information will be accessed using the access-token when the app is not running. - Regular Facebook access_token expires after a certain period of time. The app requests the permission of long-term access_token, which never expires unless you remove the app authorization from your Facebook account setting. 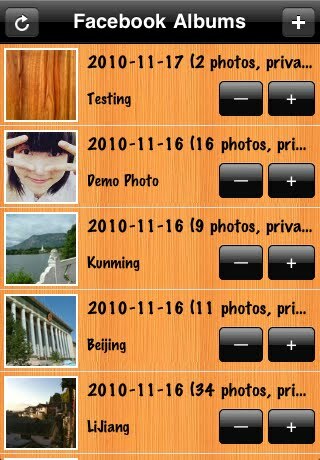 The reason for the request is that the app caches photo and album information to improve performance. If the access_token expires, the app will fail to work properly. ** Use "Reload Friends" to login again to grant the app authorization. **** This application was not developed by Facebook.